"We are family. And family always takes care of each other." After the mammoth failure (like you could call it anything else) ofGlitter, Mariah Carey was on MTV discussing her upcoming projects. There was of course her comeback CD, other assorted collaborations, and then there was a little film called Wisegirls, which Carey said would be premiering at the Sundance Film Festival in early 2002. I was intrigued—well as intrigued as a non-fan of Carey's could be. Could it be that Carey had a good film in her? The cast of Mira Sorvino and Melora Walters certainly helped raise my interest, as well as director David Anspaugh, who made such classics as Rudy and Hoosiers. My anticipation that this could be a good film came to a grinding halt. Within the hour and a half running time, it became an unavoidable certainty that there was little here to save the Carey's career, or further that of anyone else associated with the project. Wisegirls introduces us to Meg (Sorvino), at absolute rock bottom after making the worst possible choices in her life. Struggling, she moves in with her ailing grandmother and takes a job at a "family"-run restaurant as a waitress. There, she meets Raychel (Carey) and Kate (Walters), two waitresses who have fun dealing with the overly friendly and loud clientele. As Meg becomes comfortable with her job and her surroundings she starts to befriend some of the mafia patrons, and with her medical training she saves the life of an underling of a mob boss named Mr. Santalino (Nascarella). Soon, she is deep in the mafia world and has seen things she never imagined, things that may mean the difference between a happy life and one spent under the control of the mob. Too much of what occurs in Wisegirls comes at a point when the viewer has no real reason left to care. As we see the girls bond, the film becomes something of a "chick flick" in Godfather clothing, which is nice, if still a tad boring. But when a key events happens, the action dramatically shifts gears and becomes a sub par thriller. If the filmmakers had made a choice and picked a genre from which to work, this may have been salvageable; as it stands, it is a waste of two mildly entertaining ideas. The cast, comprised of an Oscar® winner, a Grammy winner, and a Paul Thomas Anderson regular does shockingly below average work. Sorvino continues to make poor choices in roles; here, she sort of sleepwalks through the production without the command or charisma she showed in Mighty Aphrodite or Beautiful Girls. A bright spot, but still undeniably dim, is Carey, who seems to be having a blast playing the overly sarcastic Raychel. Walters does serviceable work here, but she is never given much to do. Image Transfer Review: The 1.85:1 nonanamorphic widescreen transfer for Wisegirls is indicative of the low budget with which the film was made. Colors are muted and lack the pop seen on so many better transfers. Edge enhancement is thankfully absent, but I did notice quite a bit of grain in many scenes. Audio Transfer Review: A Dolby surround track is rather uneventful, as only dialogue shows up in excess. The center channel did sound quite nice though, making the mix a nice effort. 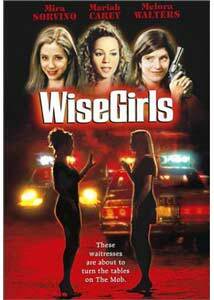 Extras Review: The disc I received for review was a screeener and featured only the theatrical trailer for Wisegirls. Your version of the disc may differ. A bland and uninteresting film, Wisegirls offers no real sense of excitement in either of the two genres it straddles.